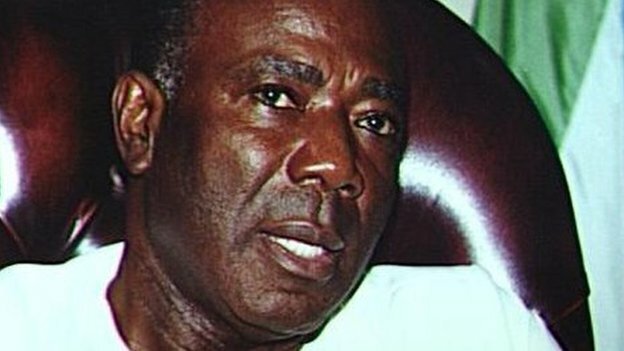 Sierra Leone‘s ex-president and war-time leader Ahmad Tejan Kabbah has died at the age of 82 after a long illness. He died on Thursday afternoon at his home in the capital, Freetown, with his wife and close family members at his side, reports say. In a statement, Sierra Leone’s government said Mr Kabbah’s death was an “irreparable loss”. Mr Kabbah was praised for his leadership during and after Sierra’s Leone’s decade-long civil war. Tens of thousands died in the conflict, with many more maimed and raped. The rebel Revolutionary United Front‘s trademark was to hack off the hands or feet of their victims. The conflict officially ended in 2002 after foreign forces intervened to help defeat the rebels. Mr Kabbah was first elected president in 1996, ending a decade of military rule. He was briefly ousted in a military coup the following year before being restored to power by a West African regional force. He won a landslide victory in the 2002 elections and was praised for maintaining peace and establishing democratic institutions, although he was also criticised for failing to tackle poverty. “If we are now enjoying peace and stability in Sierra Leone, there is no way President Kabbah could be dissociated from that,” government spokesman Abdulai Bayraytay said on Thursday. Born in 1932, Ahmad Tejan Kabbah began his career in public service in 1959, rising to become the youngest permanent secretary in the country in the late 1960s. He then spent 21 years working for the UN Development Programme, based in New York, Lesotho and Tanzania. In 2012 the UN-backed Sierra Leone war crimes court in The Hague convicted former Liberian leader Charles Taylor of aiding and abetting war crimes in the Sierra Leone civil war. He was the first former head of state convicted by an international court since the Nuremburg military tribunal of Nazis after World War II. Posted on 14th March 2014 by newsafrica. This entry was posted in Africa, Headlines, Human Development, Human Equality, Human Rights Violations, Sierra Leone, Terrorism, Women's Rights and tagged Ahmad Tejan Kabbah, Charles Taylor, Freetown, Kabbah, Revolutionary United Front, Sierra Leone, Thursday, United Nations. Bookmark the permalink. exactly as Bieber’s music careers develops and transitions against child natural born player which will new star, your man’s good results will be based on more on the flexibility involving special promotion sports team spun to manoeuvres to hopeful something. Religiosit茅: les Am茅ricains musulmans sont plus religieux que les autres Am茅ricains, mais moins susceptibles que ceux des pays 脿 majorit茅 musulmane 脿-dire la religion joue un r么le important dans leur vie de 80% des Am茅ricains musulmans par rapport 脿 la quasi-totalit茅 en Egypte, l’Indon茅sie, le Bangladesh et le Maroc, par exemple . groupe religieux transmet le plus uniform茅ment le long de l’茅chiquier politique lib茅ral 29%, 38% mod茅r茅e, 25% conservateur. no matter what, The notice for moisture not necessarily throughout on their own remember, though,but can be consequence from bacterium your passes on the cover.